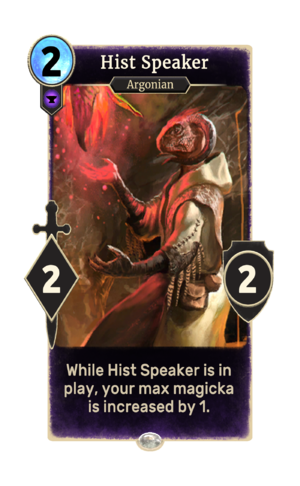 While Hist Speaker is in play, your max magicka is increased by 1. Hist Speaker is a common Endurance creature card. It is part of the Core Set. "I draw power from these trees." The card is named for the Hist, the mysterious magical trees of Black Marsh. This page was last modified on 15 February 2019, at 18:52.